England’s Alice Hewson made history when she became the first Englishwoman to play a competitive round at Augusta National, the home of The Masters. She was one of just 30 players to qualify for the final round of the inaugural Augusta National Women’s Amateur in Georgia, USA. She went on to finish in 10th place on one-over par for 54 holes, with a level par final round which included five birdies, despite double bogeys on the first and last holes. “It is very, very exciting,” said the 21-year-old international from Berkhamsted, Hertfordshire, who is a student at Clemson University in the USA. The first two rounds were played at nearby Champions Retreat in Augusta, Georgia and Hewson made the cut after playing the first 36 holes in one-over. She qualified in 11th place with rounds of 76 and a brave, three-under 69 which turned her fortunes around. In the first round Hewson had struggled with her irons and her four-over score left her well adrift of the cut line. “Work to be done tomorrow,” she commented as she headed straight to the range, where a Facetime chat with her coach revealed she was rushing a bit with her shots. “Maybe the circumstances of this event!” she said. In the second round she remarked: “I saw some of the scores the leaders were posting and I knew there was a good round out there. I just went out with lots of confidence and got off to a quick start – and that always helps. Just 30 players made the cut for the final round, but the full field played a practice round at Augusta National. 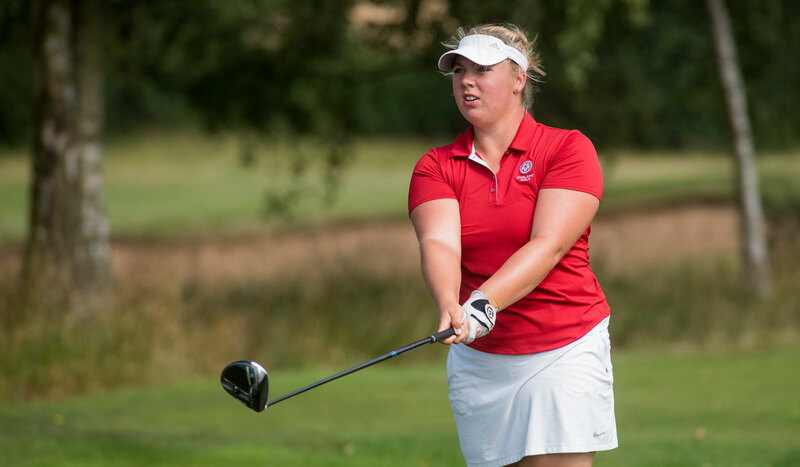 This included England’s other representatives, Annabell Fuller (Roehampton) and Lily May Humphreys (Stoke by Nayland) who shot plus six and plus 12 respectively. Captions. Top Alice Hewson (copyright Leaderboard Photography). Below Lily May Humphreys (left) and Annabell Fuller at the championship.